A few things before I let you read the post. First, thanks for sticking with me and my weird subscription issues. Second, thanks for commenting! I love reading any responses! Okay, now onto the show. A few weeks ago I was wandering around the city after classes with a friend and I saw this amazing building on the other side of the road and both of us were like “wow what on earth is that” because it was a spectacular building. I am in the land of spectacular buildings but I was still struck by this so we went to investigate. The building was surrounded by walls and by every entrance there was a guard restricting people who wanted to enter and there were signs saying “No public access—school in operation” which made me very curious. I asked the guard what the building was and why there were signs everywhere and he looked surprised that I had had to ask. 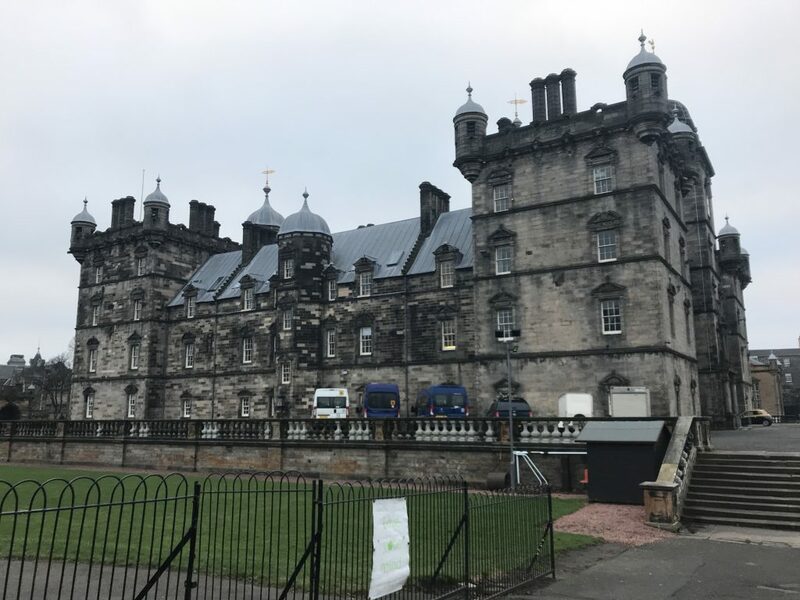 Apparently the building that I accidentally discovered is called George Heriot’s School, a private school at which J.K. Rowling once taught and the building is reputed to be the inspiration for Hogwarts. I almost fell over right there. 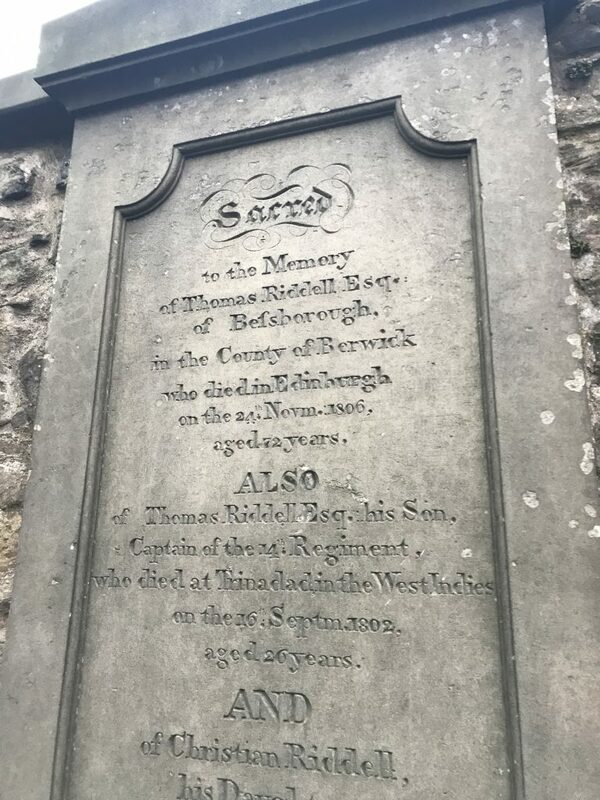 The guard then said that a close distance away there was a church with a graveyard where J.K. Rowling used some of the names on the gravestones for Harry Potter characters. 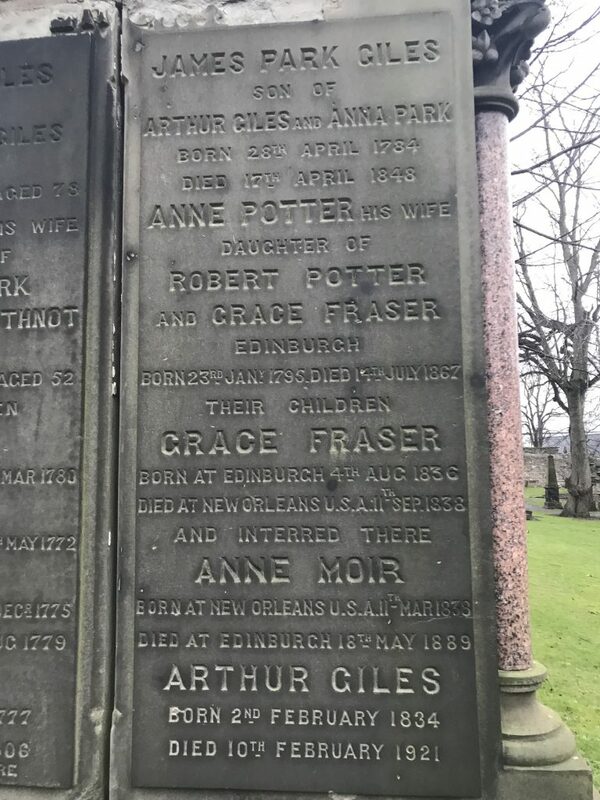 I was with a friend and we were on our way to find the street that inspired Diagon Alley from Harry Potter, so the graveyard would have to wait. 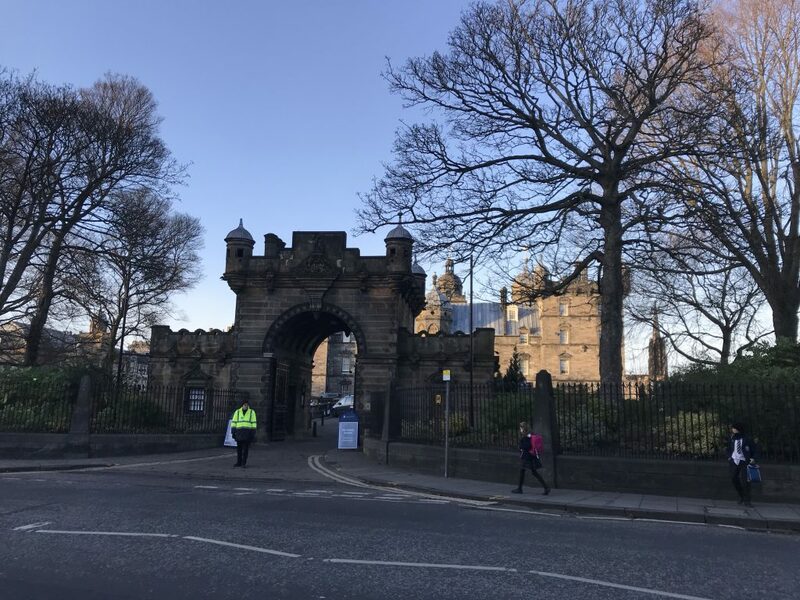 Just as we thanked the guard and went on to find Grassmarket, school let out and I watched in complete delight as students came out dressed in what looked to me to be a Hogwarts uniform with Ravenclaw scarves and ties. All they were missing was the robes. As we made our way from Hogwarts to Diagon Alley, I kept looking up to see Edinburgh Castle towering over us on Castle Rock and everything was gorgeous and brilliant. Just a few streets over we found Victoria Street just off of Grassmarket. Even if this street did not have ties to Harry Potter it would be completely worth a visit. It is a beutiful curved street with brightly colored buildings that take the same curve the street does. It is built on levels and you can go up a level and overlook everything, which we did. 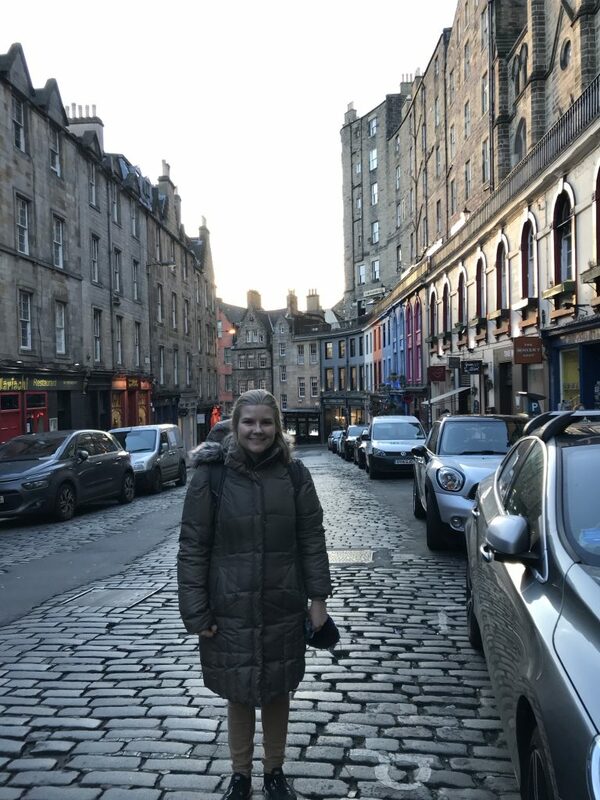 While there are quite a few Harry Potter shops along the street, there are also the usual tourist shops selling cashmere and tartan themed clothing and I even saw a wedding party on one end of the street. When I started thinking about Destination: Scotland! Edinburgh wasn’t even on my first list of choices as I was focusing on the lesser known universities. But then both my mom and my friend Neva told me to think about Edinburgh. 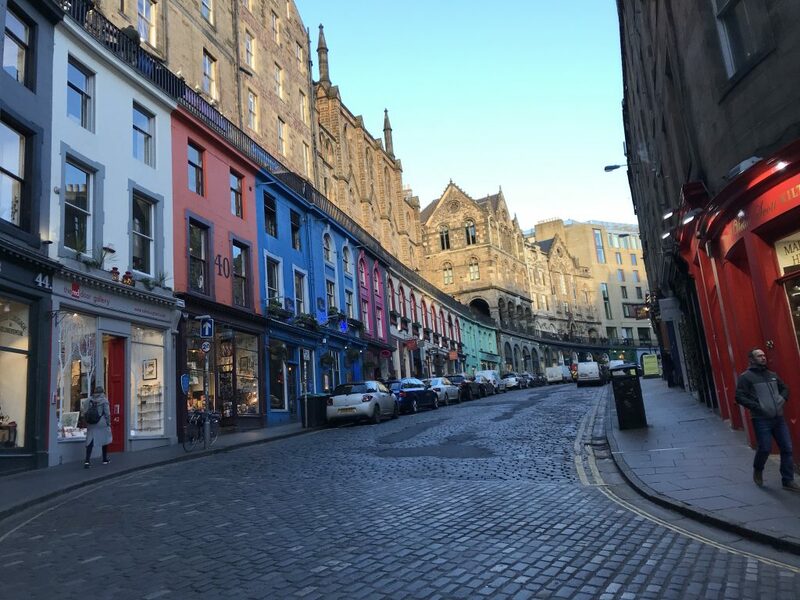 My point in saying this is that I did not have a Harry Potter themed ulterior motive in coming to Edinburgh, but now that I’m here it is so much fun to see how the city influenced the world of Harry Potter. The next weekend, myself and two friends from my flat (Lena and Lynn) decided to climb Arthur’s Seat which is essentially the extinct and eroding volcano that overlooks the city. This was completely amazing and not a hard hike at all and to top it all off the view was completely incredible on the top. 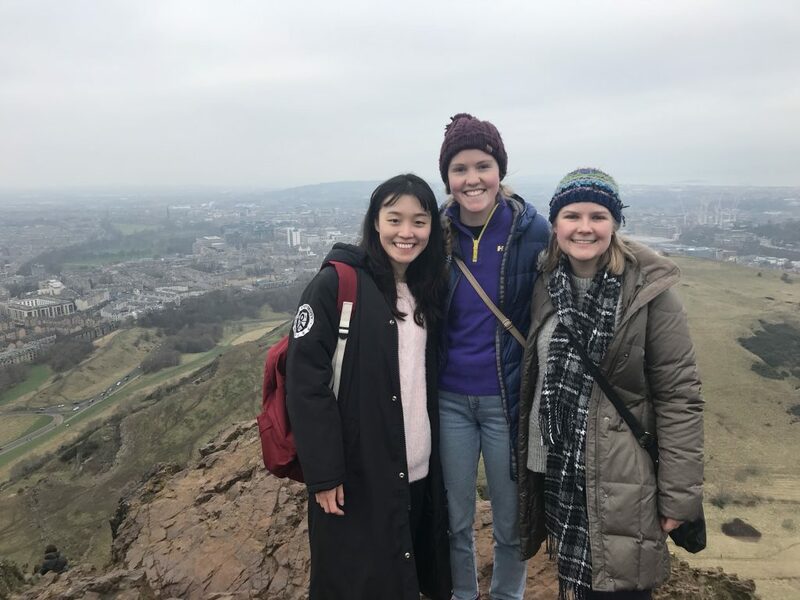 You can see the entire city from the top (even thought it was freezing) and you can see the Firth of Forth and it was fun to be with friends and to feel like we were on top of the entire city. On our way down we went looking for a cafe, and when we were in the age I told my friends about my Harry Potter themed adventure the previous week, so we decided to go find Greyfriars Kirk with its graveyard. Just more fun to be had! It was quite hard to find some of the graves (I had to enlist the help of Google) but it was still a nice time walking around and exploring. It was kind of weird that with a few exceptions, the only graves with flowers were the Harry Potter themed graves. I don’t know how I feel about that. After a while we were all tired and cold so we called it a day. In further Harry Potter related news, I have joined the Harry Potter Society, to I’m sure absolutely nobody’s surprise. During the first meeting, we had to fill out a quiz so they could sort us into houses. Unlike the easy multiple choice quiz I was expecting, we had to give answers to questions like “If you were lost in the Forbidden Forest and could bring one person with you, who would you bring and how would you escape?” I said I would bring Paige because she has a great sense of direction and that I would take care to befriend a phoenix so if we couldn’t find our way out we could call them for help. After we filled out the quizzes we were sent out of the room and when we came back, everything had been rearranged to resemble the Great Hall of Hogwarts. Banners hung on the walls of each table and there was a head table with each of the society leaders in the front. Right by the head table there was a stool and a guy holding a hat and he called us up one by one to place the hat on our heads and to sort of. I was sorted into Ravenclaw. After we were all sorted, we socialized and ate cookies and chips and other junk food for our welcoming “feast.” Harry Potter Society meets every Wednesday and does different activities. So far there have been two different pub quizzes but there have been other activities too. 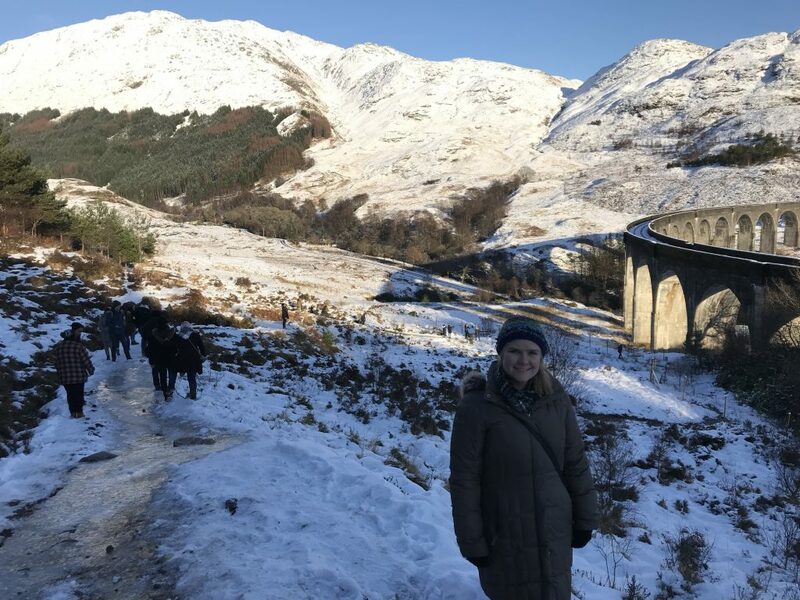 As for the latest Harry Potter themed adventure, the weekend before last, I signed up to go on an excursion sponsored by the International Exchange Student Society to the Glenfinnan Viaduct, which is a shooting location for some of the Harry Potter movies, specifically the train scene in Chamber of Secrets and as the Black Lake in a number of the movies but most notably the second task scene in Goblet of Fire. The bus left from the main library at 7:45 and we drove up to these destinations with several scenic stops along the way in the Highlands. There was one major drawback which I probably should have seen coming and that was the almost intolerable levels of motion sickness I experienced. I felt very awful both for myself and the lovely girl I was sitting next to as I could not contribute anything to the great conversation we had been having and had to focus on breathing. Luckily I did not puke. Several stops into the trip we stopped at a town called Fort William for lunch were I was able to buy anti-nausea travel medication. I spent the rest of the trip in a somewhat groggy haze but I would take that any day over the nausea I experienced earlier. Then we finally made it to our final destination of the viaduct. The views were fantastic. 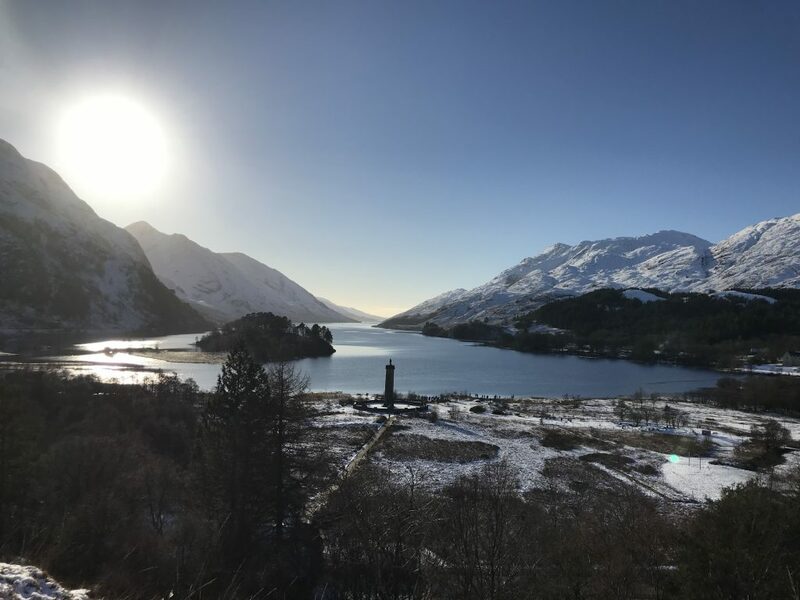 When you look in one direction, you see Loch Shiel, the lake that resembles the Black Lake from the films, minus Hogwarts sitting on its banks and some CGI effects that remove any inconvenient islands. 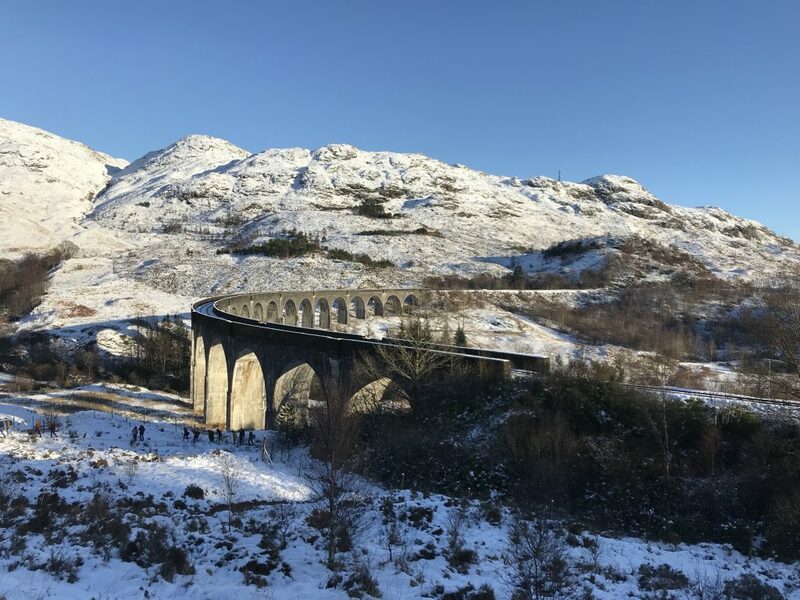 Then in the other direction was the Glenfinnan Viaduct: the bridge upon which the Hogwarts Express travels. This was so very obviously the bridge—no CGI effects (minus a flying car). But even had there been no Harry Potter connotation it was worth the view. We hiked closer to the viaduct and then up a hill to get a different view of it. Everything was so icy that people were sliding around and falling right and left so at some point I gave up and was happy with the view I had. There was a church nearby which was unfortunately closed but it was also on a different side of the lake so we got to see everything from a different angle. 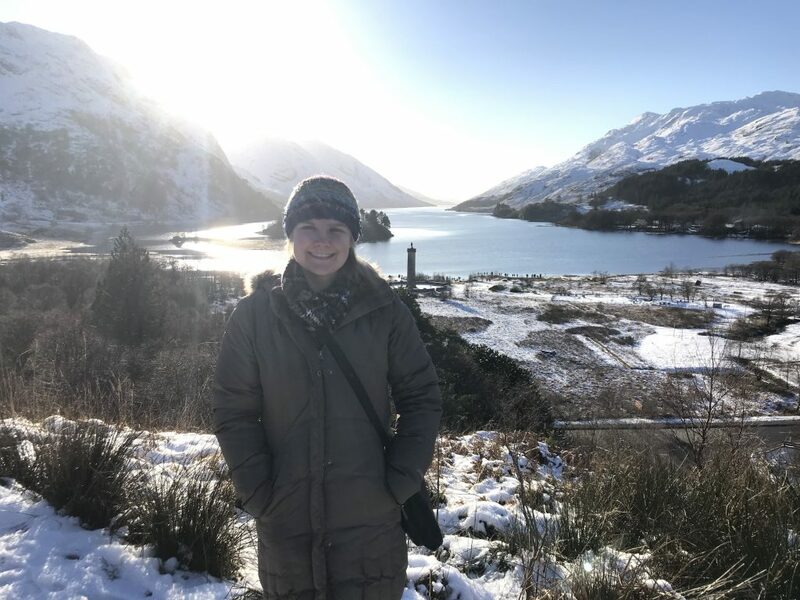 Finally, there was a monument for the Bonnie Prince Charlie down by the lake that we examined, as the Glencoe Uprising in the Jacobite Rebellion took place nearby. After a few hours, we all got back in the bus to head straight back to Edinburgh. Our tour guide put in Harry Potter and the Chamber of Secretsto play on the ride back and luckily because I was drugged I was able to watch it without further nausea. However, because I was drugged, I only stayed awake as far as the train scene (we all cheered when we saw the shots with the viaduct) and then I promptly passed out. I only woke up when we were near the city outskirts and Harry had just defeated a basilisk. 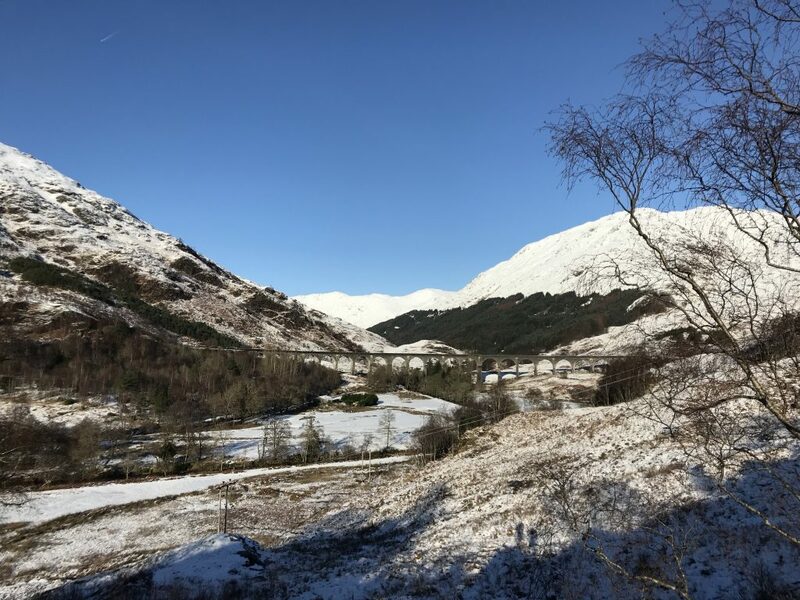 I have more exciting news expect this post took me a week to write as I keep getting distracted (I’m in Scotland!) so I’ll post again hopefully soon. That is to say, if the choice is between blogging and finding St. Giles Cathedral, I’m going to find the cathedral.